Many people have a tendency to hibernate in winter, and even most who do exercise often take their workout indoors. However, if running on the treadmill is giving you cabin fever, you can head outside. Just be sure to take a few precautions. 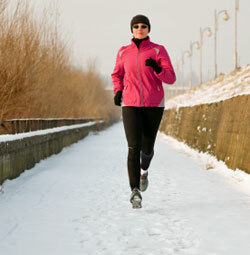 First, check with your doctor about whether it is safe to exercise in the cold. This is especially true if you have a heart condition or asthma or other respiratory issues. In addition, certain medications can make you more susceptible to cold. Also, use common sense. Stay inside if it is extremely cold or windy, or if there is a lot of snow. Especially if you are going to be sharing your exercise space with motorists – such as if you plan to run on or across roads – make sure that the light and visibility are sufficient for drivers to see you in plenty of time. Wear reflective clothes if you are outdoors at night. Beyond that, the biggest challenge of exercising outdoors in winter is dressing properly. The key is to dress in layers. That way, you can remove some layers as you get warmer during your exercise and put some layers back as you cool down afterward. Dri-fit clothes, which wick moisture away from the skin, are excellent for the bottom layer. Choose waterproof clothes for the top layer, especially if it is precipitating or if you are exercising somewhere where snow could fall off trees or buildings. Pay special attention to your hands, feet and head. Because your body focuses on keeping your core warm when it is cold out, you can be at risk of frostbite on exposed extremities such as your ears, nose or hands. Wear a hat, mittens and warm socks. And make sure your shoes have sufficient traction to deal with wintery terrain. Finally, there are several similarities between exercising in summer and exercising in winter. For example, you always need to remember to wear sunscreen. The snow reflects sun much like water or sand can, so you need to put on plenty of sunscreen before you head outside and reapply as appropriate. You also need to stay hydrated. You sweat when you exercise, even in winter, and sweating depletes your fluids. So hydrate before you head out, and bring something to drink while you exercise. Know the signs of trouble. Just as you need to be able to recognize heat exhaustion or heat stroke when you exercise in summer, you need to know the signs of frostbite and hypothermia when you are outside for prolonged periods in the cold. Frostbite is most common in the hands, feet, ears and nose, and early signs include tingling and loss of sensation. If you think you might have frostbite, get out of the cold and gradually warm up. However, don’t rub the affected part, because you can cause damage to your skin. If your warming efforts don't work, go to your doctor or an emergency room. Older people are most susceptible to hypothermia, or an unsafe cooling of your body temperature, but it can affect anyone. Look out for extreme shivering, slurring of speech, loss of coordination and fatigue, according to the Mayo Clinic. If you think you have hypothermia, seek medical attention immediately. And, just as when you exercise outdoors any other time, make sure someone else knows where you are going and when you are likely to be back.